St. Vincent, Rainbow Kitten Surprise and more — here’s what you can look forward to this week on ‘World Cafe.’ Listen Monday-Friday at 11pm on KXT. This week, Dessa talks about the unique way she came up with her album, Low Cut Connie shares their encounter with Sir Elton John and more. 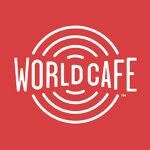 Listen to ‘World Cafe’ every weekday at 11pm on KXT.